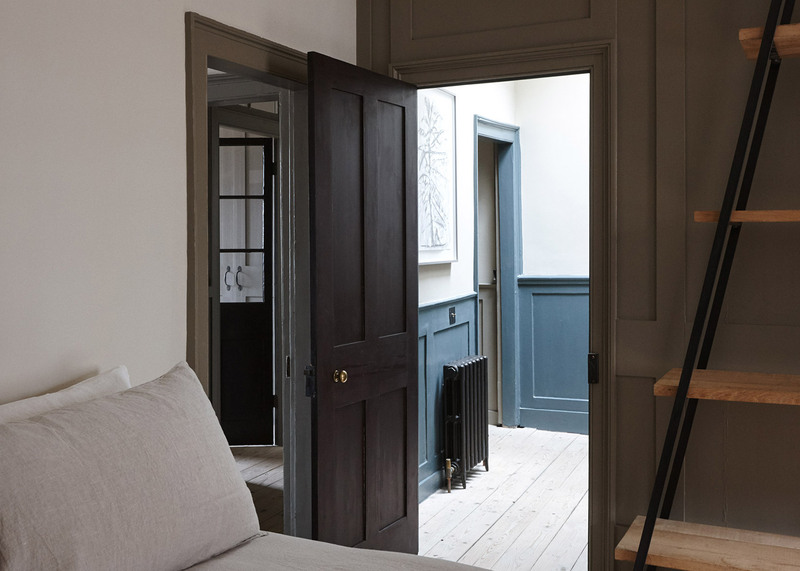 London fashion store Hostem has launched its first guesthouse – a refurbished Georgian house with furniture from Pierre Jeanneret, Faye Toogood and Max Lamb, and accessories that guests can buy (+ slideshow). 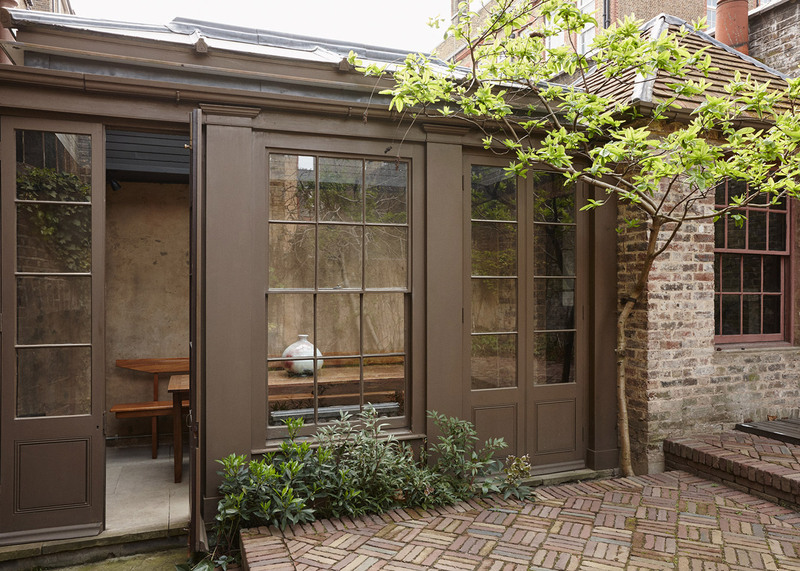 The New Road Residence is a restored 1797 linen draper's house in the Myrdle Street conservation area in Whitechapel. Hostem founder James Brown and the brand's artistic director Christie Fels are using the project to test the idea of a "curated residence". Visitors rent the house in its entirety and can buy some of the products at the end of their stay. These include homewares provided by London store Labour and Wait, crystalware by Austrian brand J & L Lobmeyr, and Lazy Eye ceramic crockery by London designer Skye Corewijn. 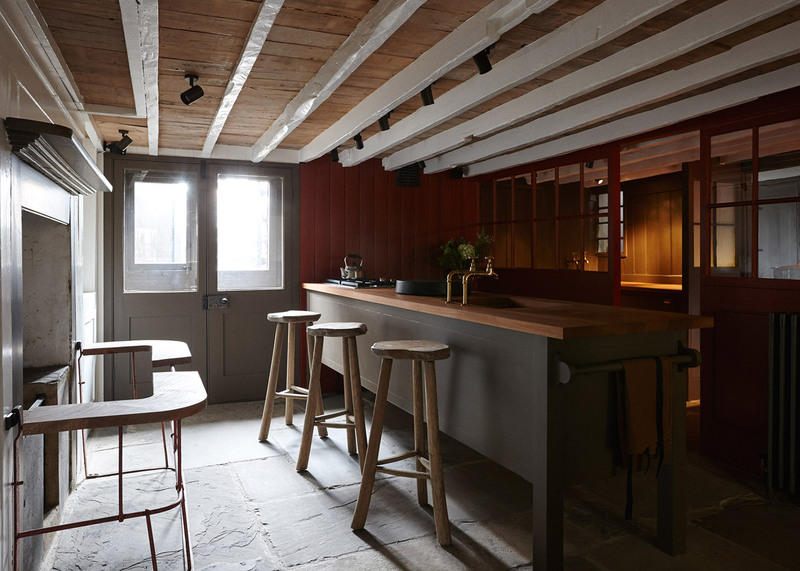 A room by the front door has been fitted out as a bootroom and "lifestyle mini bar", with floor-to-ceiling cupboards for storing coats and outdoor kit as well as stock of all the available products. "The inventory of product available to purchase is a natural nod to our roots as retailers," said Fels. "Hostem has an opinion on ceramics and lifestyle but isn't necessarily the outlet for it." "The house presented us with an opportunity to work with anything from Viennese glassware by J & L Lobmeyr to Crane Cookware in a more meaningful way," she explained. "The fact that you can take these elements home from the converted bootroom store, is like having a 'lifestyle minibar'." "I think you should be able to take the linen home if you fancy wherever you stay," added Fels. "Because the store is only open to those who stay, it's as experiential and personal as it gets." The three-bedroom house had already been restored by previous owners. 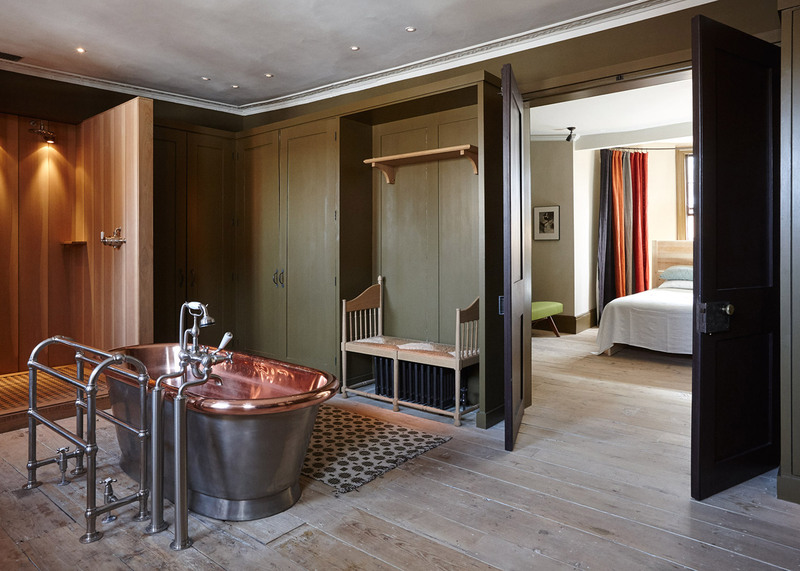 Hostem added bespoke cabinetry, a kitchen in the basement, bathrooms with copper fittings, and a selection of furniture created by well-known designers and by its in-house team. "The furnishing evolved completely organically," Fels told Dezeen. "We used our in-house wood shop and carpenters to do a lot of the work which meant no design decisions had to be final." "The house has been restored piece by piece by previous owners and today is filled with work from friends or the Hostem founder's private collection, so the end result is a collaborative one," she added. The 265-square-metre house is arranged over four floors, with a split-level rear extension. The basement contains a large kitchen and dining space with fitted window seats at the rear. The original Georgian pantry, larder and wine cellar area are retained. 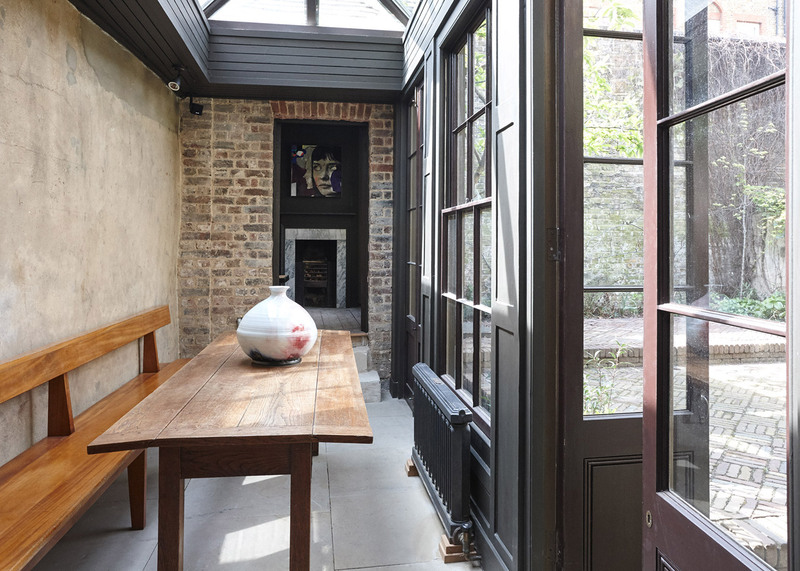 Steps lead up from the dining space into the walled garden with the extension on one side, which now contains a long table and a small reading area at the back. The raised ground floor features an open-plan living space, with a dining area at the front. Furniture here includes the Roly-Poly chair by British designer Faye Toogood. "New industrial design pieces by Faye Toogood counteract the building's historical roots, whilst blending seamlessly with other organic décor elements," said Hostem. The first floor houses a master bedroom and en-suite bathroom and dressing room, with a tiled walk-in shower and floor-to-ceiling cupboards. A separate shower room caters to occupants of the floor above. A double bedroom on the top floor includes a desk by 20th-century French designer Pierre Jeanneret from the Indian city of Chandigargh, where Jeanneret created all the furniture for buildings by his architect collaborator Le Corbusier. Other Jeanneret pieces in the house include a card table and chairs. The rest of the top floor is occupied by another bedroom, with two single beds, and a utility room with a sink and appliances that are hidden inside more floor-to-ceiling fitted cabinetry. 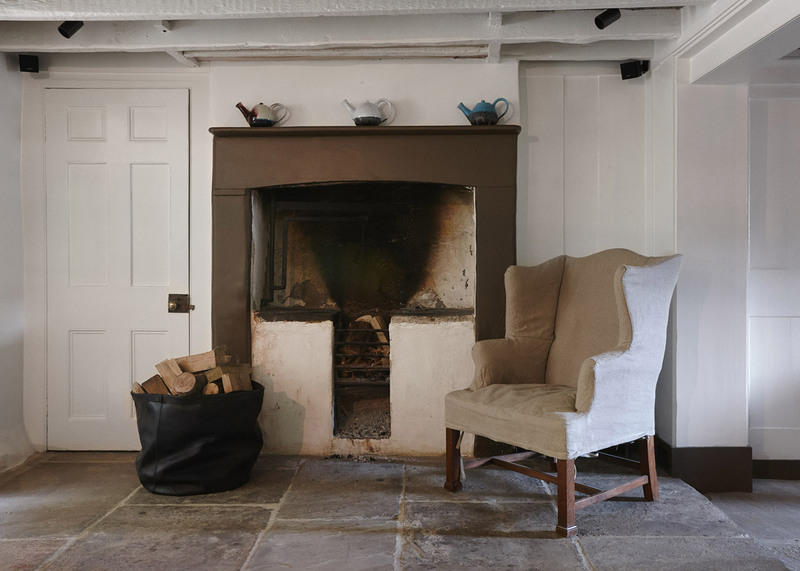 A coated polystyrene chair by Max Lamb – similar to those he provided for the Albanian pavilion at this year's Venice Architecture Biennale – sits on the landing. Among other designer furniture in the house are heart chairs by 20th century Danish designer Hans J Wegner. Beds, bookshelves, side tables, shelves and shutters were created by Hostem's in-house team. 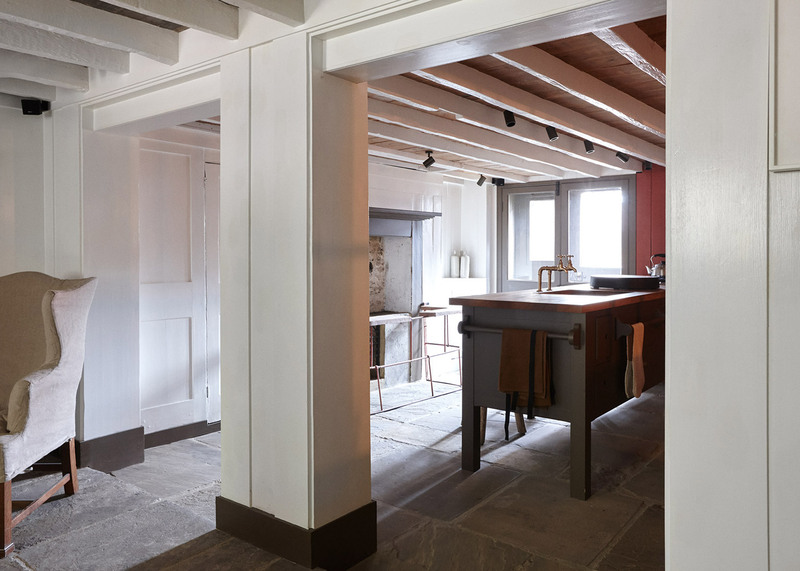 The colour palette for the walls and upholstery was based on the original framework and stone flooring of the house, with dark greens and reds as well as more neutral tones. 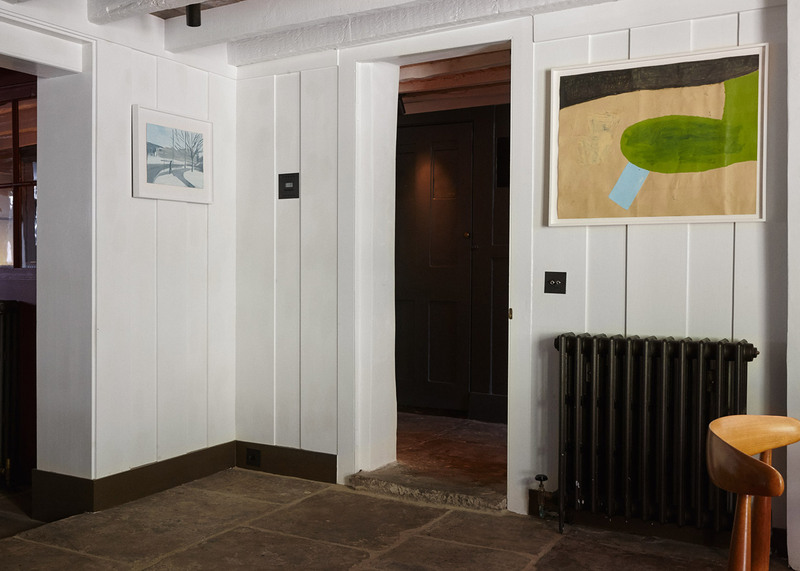 Art on the walls is borrowed from London gallery Stuart Shave/Modern Art and includes work by Tory Thornton, Mark Flood, Richard Tuttle and Paul Lee. Based in east London, Hostem has previously worked with British designers including JamesPlumb and FayeToogood on its store interiors and installations. Shoppable residences have been emerging as a cross between luxury guest accommodation and personal shopping, creating a new niche to compete with traditional hotels. Examples include a Melbourne apartment converted into an Airbnb-style rental property, where guests can buy the furniture, art and accessories when they leave.